Why Travelling During Peak Hours Is Difficult In The Metro Cities? The increasing number of vehicles has not only resulted in strengthening the problem of pollution, but also has emerged as the severe issue for increasing the normal time of travel in the metro cities during the peak hours of the day. This is revealed in the recent data provided by the leading cab service provider Uber. The data is based on the drives made by the Uber in the cities like Mumbai and Delhi. The data also states that most of the time due to concentration of commercial activities in some parts of the city, the traffic moves in the same direction during the specific hours of the day. 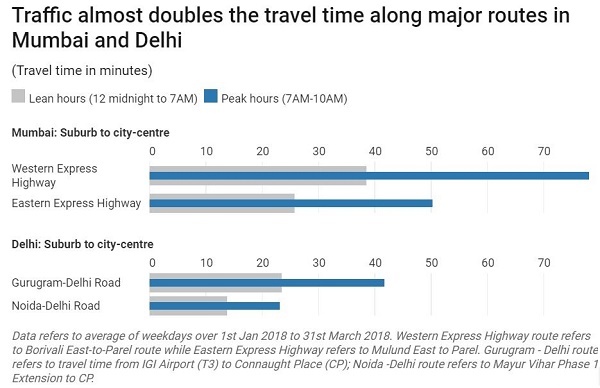 The time taken to move between the suburbs and the city centre in Delhi and Mumbai during the morning hours from 7 a.m to 10 a.m is generally higher than compared to the travel time on the same route during the midnight to 7 a.m. Let us, for instance, take the travel time between the suburbs from Borivali to Parel on Mumbai Western Express Highway in Mumbai is mostly double during the peak hours. The situation became worse between Janaury and March 2018 due to diversion of traffic because metro construction work and the development of Western Express Highway (WEH). But, the situation was almost the same even before this. 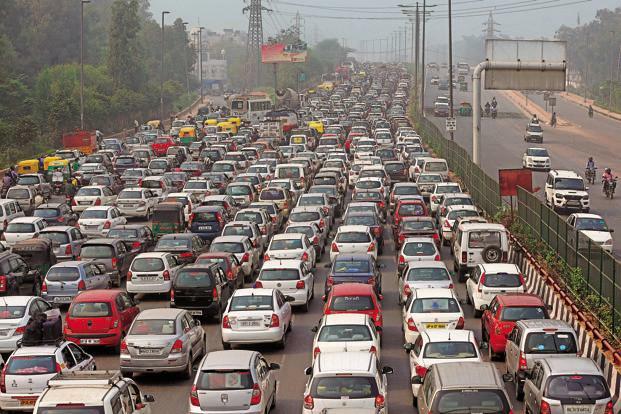 The same situation was noticed on the Gurgaon-Delhi highway where the commuters have to spend 77% extra time for moving over the route during the peak hours. It would be interested to know that sometimes the seasonal conditions also play a crucial role in increasing the travel timings on these routes, especially during the months of July and August. The traffic situation during these monsoon months is comparatively extremely bad in the cities of both Delhi and Mumbai. Interestingly, the months of May and June, are relaxing in both these cities due to summer vacations in the schools. According to the data shared by the Uber. The matter of concern is that despite of many efforts made by the state governments they are not able to find an appropriate solution to the problem. The preventive measures which could help in getting the rid of this problem can be the construction of separate bus corridors, encouraging people to develop the practice of sharing the vehicle, rather than driving and riding their personal vehicle. Well, these measures will be applicable for the short term, because going through the increasing number of vehicles and population there is need of some permanent solution to combat the problem.